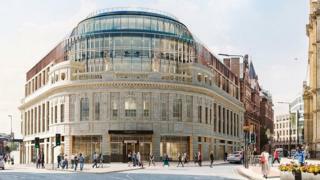 Channel 4 is in advanced talks about moving its national headquarters into the Majestic building in Leeds city centre. Last year, the broadcaster announced it was moving from London and transferring 200 of its 800 staff. The broadcaster said it was in the final stages of negotiations with developer Rushbond Group, which owns the former cinema and nightclub. Channel 4 is expected to move into the Majestic in the second half of 2020. Jonathan Allan, Channel 4's chief commercial officer, said: "Leeds offered a wealth of potential locations for our national HQ but the Majestic really stood out as an iconic building which will put Channel 4 at the heart of the city centre. "It's an incredibly impressive redevelopment and offers the right mix of location, connectivity and space for our organisation and great facilities for our staff and our partners in the industry." Leeds was chosen above Birmingham and Greater Manchester, which were also on the headquarters shortlist. The channel has also announced it will open "creative hubs" in Bristol and Glasgow, with around 50 staff in each. It is all part of a plan to increase the amount Channel 4 spends on programmes outside London by £250m over the next five years.